The LVGEA has facilitated 24 business expansions and relocations so far in 2017 that will create more than 4,900 jobs over the next five years, according to Jonas Peterson, the organization’s CEO and president, who added the region has had the highest private sector job growth in the nation. That number is expected to grow to 6,000 by the end of the year, surpassing the record number of 5,000 in 2016, he said. The Las Vegas Global Economic Alliance honored Glenn Christenson, 68, the former chief financial officer at Station Casinos with its Leadership Award. Las Vegas has come a long way in terms of diversifying the economy and has better positioned itself to withstand the next recession. That’s the message that emerged from the Las Vegas Global Economic Alliance’s annual awards dinner Sept. 28 at the Aria where 600 business and community leaders celebrated the region’s achievements and honored companies and business leaders. An example of Southern Nevada’s diversification was on display when the LVGEA gave an innovation award to Switch, a technology infrastructure company with one of the most advanced data centers in the world. One of the other nominees for the award was Hyperloop One, which has brought an international spotlight to Las Vegas with its testing of a tube transportation system that moves people and goods at 700 mph. “You have some amazing companies in Southern Nevada, so much so that people don’t realize it. We’re looking for companies that are game-changers and doing breakthrough work in technology and in this case, Switch fits that bill,” Peterson said of the company’s honor. Jeff Oberschelp, executive vice president of ecosystem services at Switch, said it’s exciting to receive the award and that it’s been a great journey in Las Vegas. Last year, the Las Vegas-based company that operates data center facilities for servers of some of the largest companies in the world, turned on its super loop that connects Las Vegas to Reno via 500-mile fiber optic cable along U.S. Highway 95. It connects Reno to the Bay Area and the Bay Area to Los Angeles and Los Angeles to Las Vegas. That instantaneous connection enables California companies to relocate to Nevada and maintain a continuity of business. Switch serves more than 1,000 clients that include eBay, Google, Intel, Cisco, PayPal, Fox, Zappos, Wells Fargo, Verizon, AT&T and Microsoft. Oberschelp said the state has been welcoming to its clients that have located to Nevada. Many Southern Nevada residents don’t see it, but the economy is becoming more diverse with new industries forming, Peterson said. As the hardest hit state in the country, Nevada lost 186,000 jobs over three years of the recession and the jobless rate of nearly 14 percent, the highest in the country. It also led the nation in foreclosures and bankruptcies. The LVGEA is partnering with the state to apply for the second headquarters that Amazon, an e-commerce and cloud computing company, has announced it will award to a North America city with proposals due Oct. 19. It plans to invest $5 billion on a new facility that would require 50,000 workers. Peterson said people shouldn’t think that Nevada will be at a disadvantage in competing in size and skill of its workforce. No matter what market Amazon selects, it’s going to require the company to recruit and grow talent on a large scale. 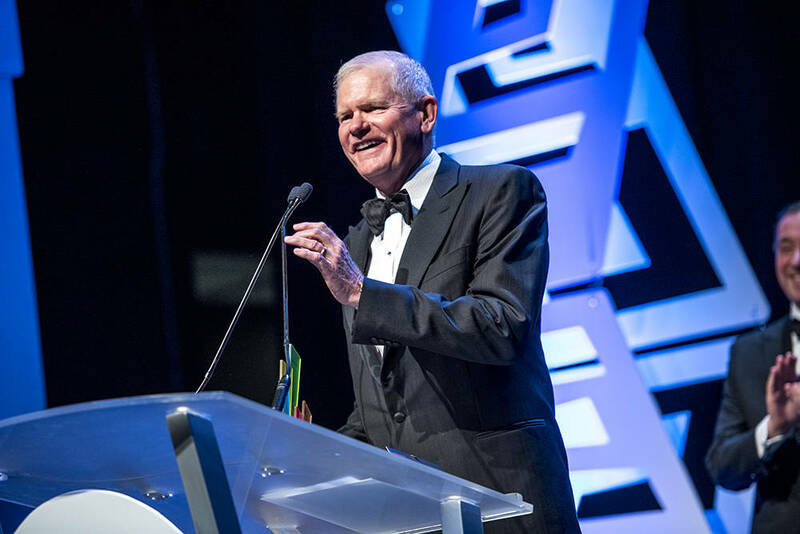 The LVGEA honored Glenn Christenson, 68, the former chief financial officer at Station Casinos and a “powerful advocate for many years on issues that shape economic development” in Southern Nevada with its Leadership Award. He’s chairman emeritus of the LVGEA, former chairman of the Nevada State College Foundation and current chairman of the Clark County Community Implementation Council that’s overseeing the district’s reorganization. There are a lot of “great reasons” for companies to come to Southern Nevada, but Christenson said that doesn’t mean the region can’t get better. It must focus on improving the educational system from kindergarten through advanced college degrees. There are “still a number of companies that aren’t coming here because of that and our workforce,” he said. Christenson said Southern Nevada is in “so much of a better position than we were” a decade ago. He said the region was complacent and the recession “woke everybody up” that people needed to think differently. That has helped the business community get behind the educational system more than it ever had in the past, he said. Peterson said Christenson is a deserving honoree as one of those leaders that has long been a part of the LVGEA. The LVGEA announced it continues to work on its regional “Workforce Blueprint,” a study designed to understand the local workforce and where it needs to go. Set to be released in the coming weeks, it will identify the top, in-demand jobs and skills needed to support the economy through 2024, Peterson said.